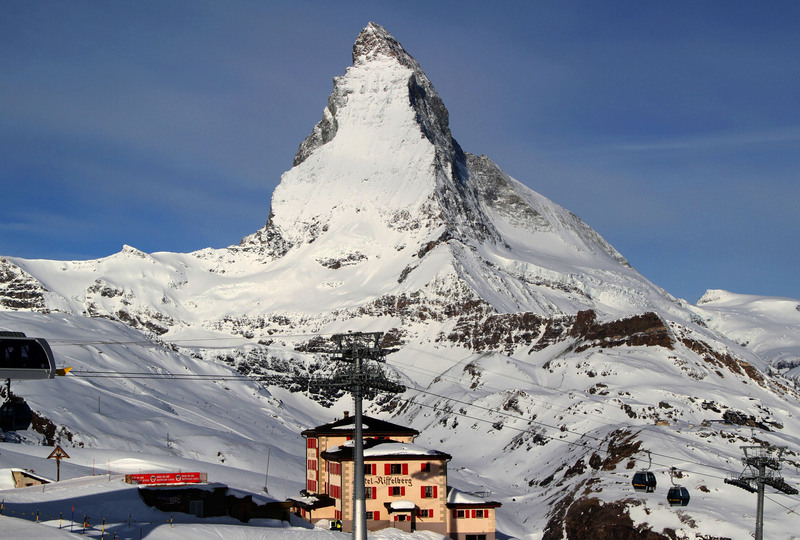 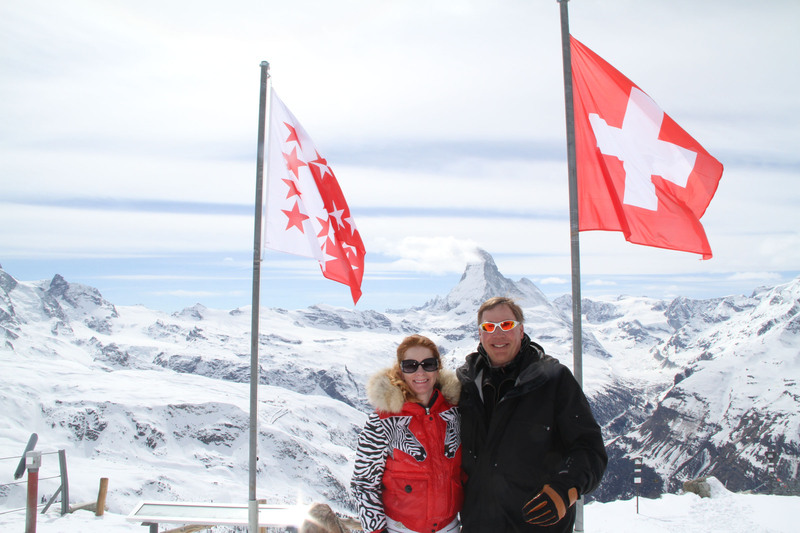 As the most photographer and revered of the Alps, Zermatt’s Matterhorn at 14,692′ should lure you for a luxury ski vacation in Switzerland. 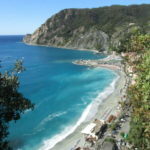 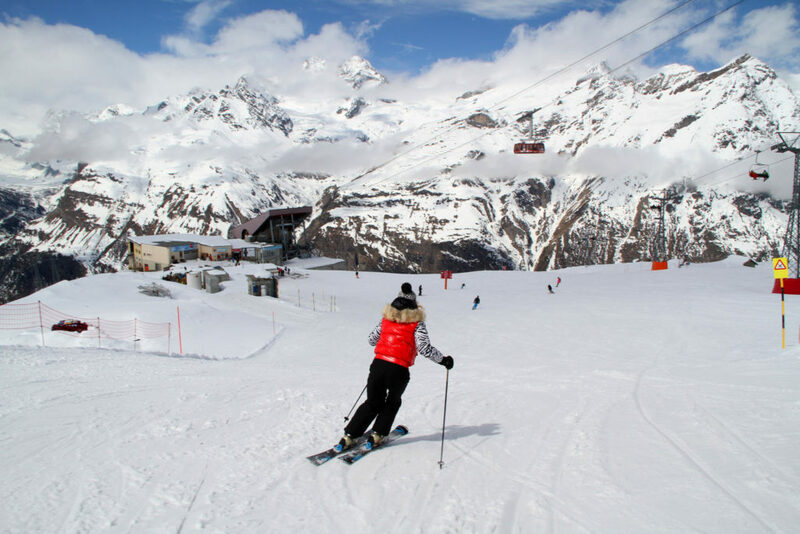 Nowhere else on earth will you find such vast alpine terrain, unrivaled scenery, the highest elevation skiing with the longest snow season in the Alps, and an historic alpine village filled with romantic Swiss chalets – reached only by train. 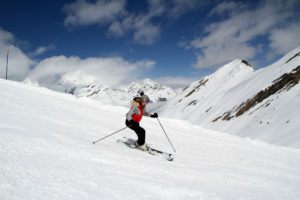 Zermatt is a ski fairytale, as you ski 7,000’ vertical descents, stopping at a traditional on-mountain chalets for Fondue lunch, perhaps skiing the afternoon in Cervinia Italy before skiing back to your five-star ski hotel for a spa or après ski dancing and drinking with the locals in this legendary ski town. 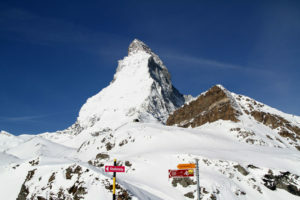 The “Matterhorn Paradise” skiing of Zermatt spans 360 kilometers of marked and groomed pistes (trails) in four ski regions, Sunnegga/Rothorn, Gornergrat, Matterhorn Glacier –also called the Klein Matterhorn, and Matterhorn Cervinia (Italy) all interconnected with amazing lifts – trains, trams, funiculars, gondolas and chairs. 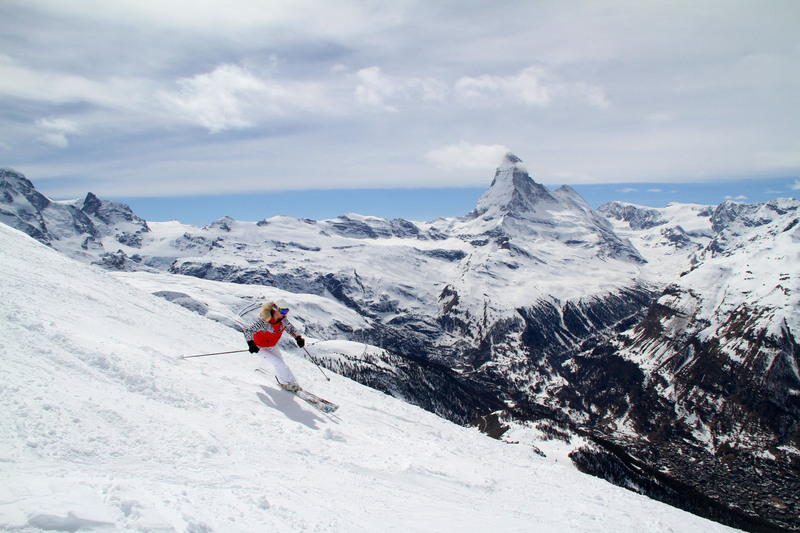 The ski slopes of Zermatt are huge, long, and varied, our average vertical was 4,000’ per run, and when the sun is out- there are no more spectacular ski slopes than here! 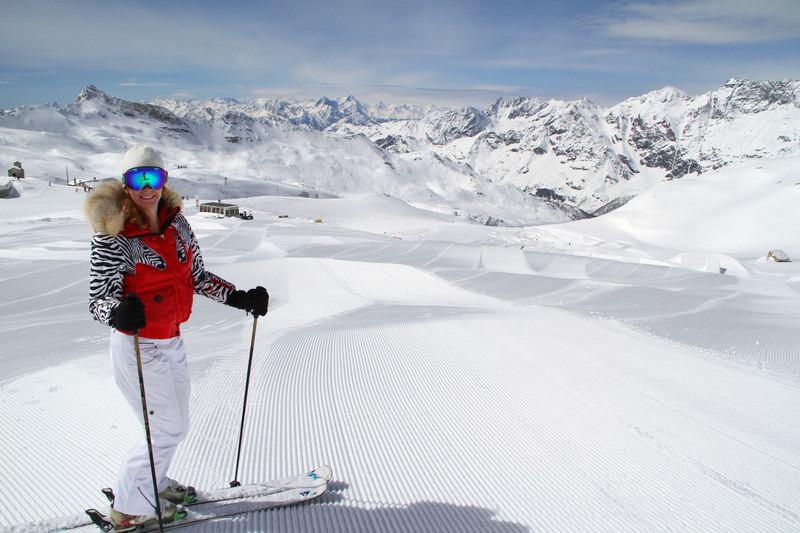 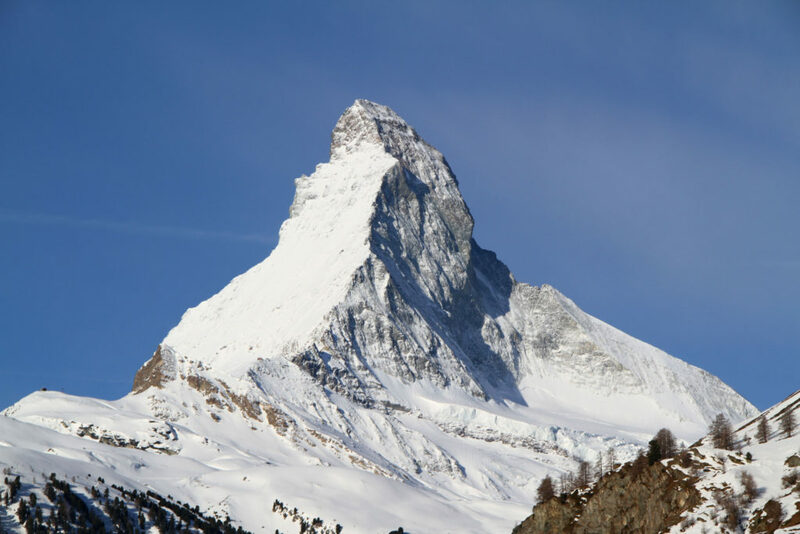 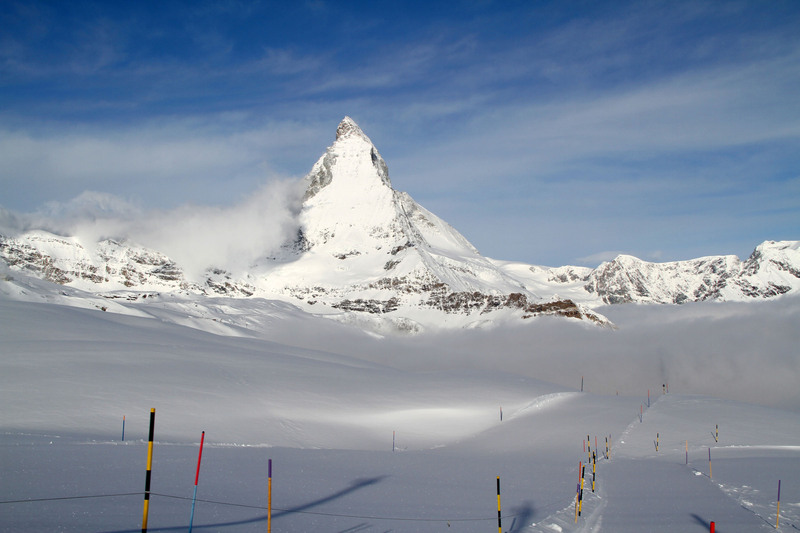 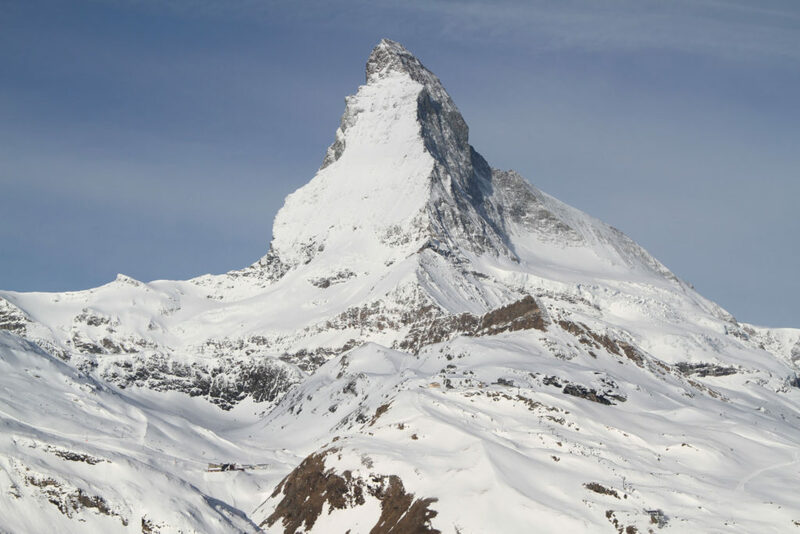 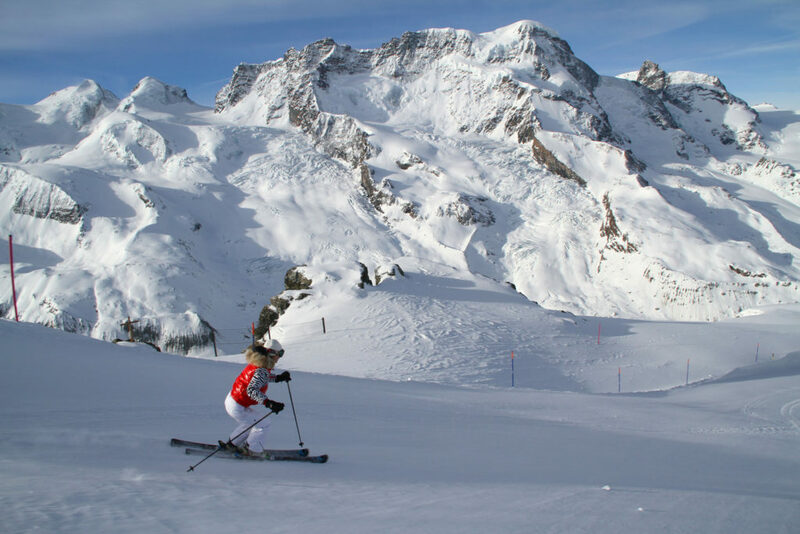 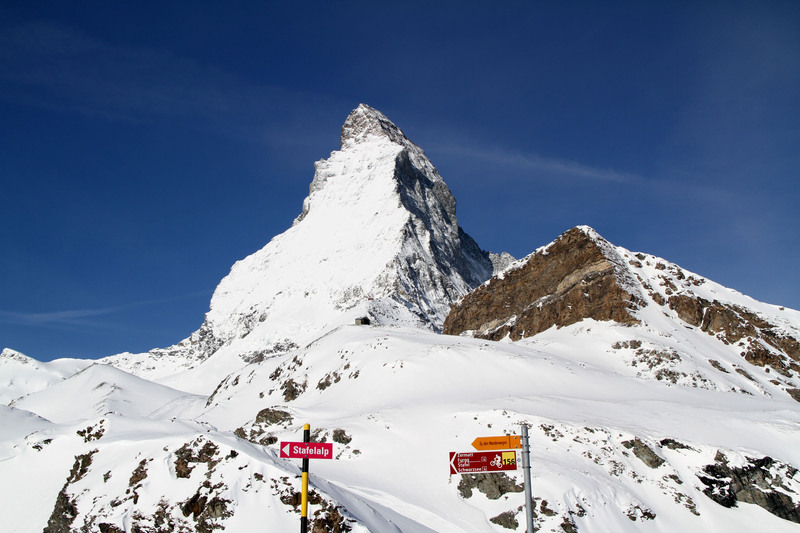 Zermatt’s base elevation 5,314′ and ski summit is 12,791.’ You can ski for miles, and days on the prepared runs, or hire a guide to venture off-piste a truly amazing Alps adventure, beware of cliffs and crevasses on the glacier. 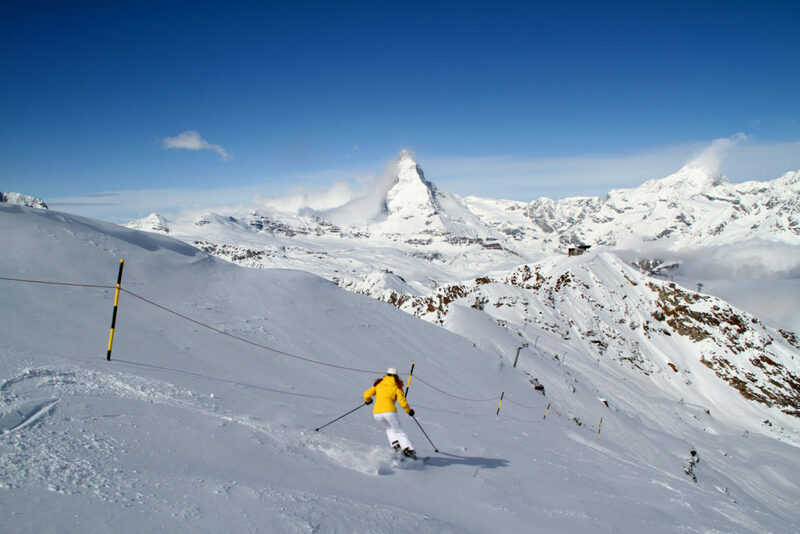 For luxury ski hotels, Zermatt has over 120 chalets and luxury hotels within walking of the ski lifts and trains, shops, après ski bars and Zermatt’s best restaurants. 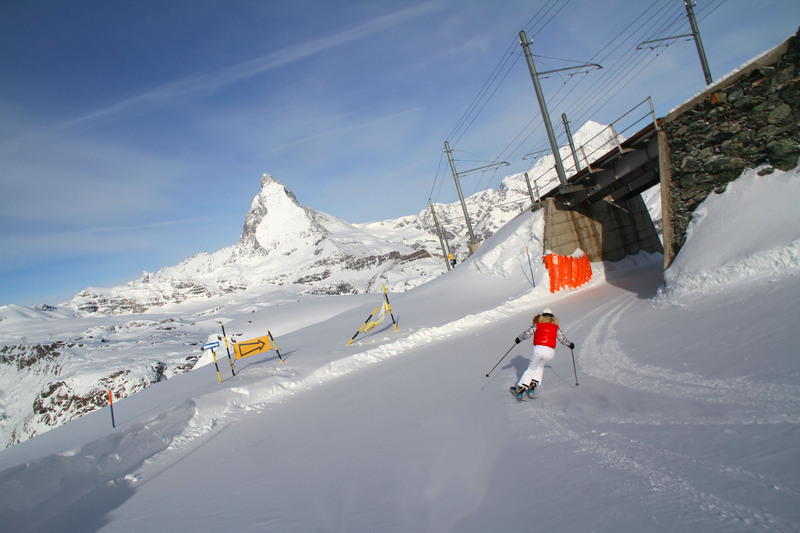 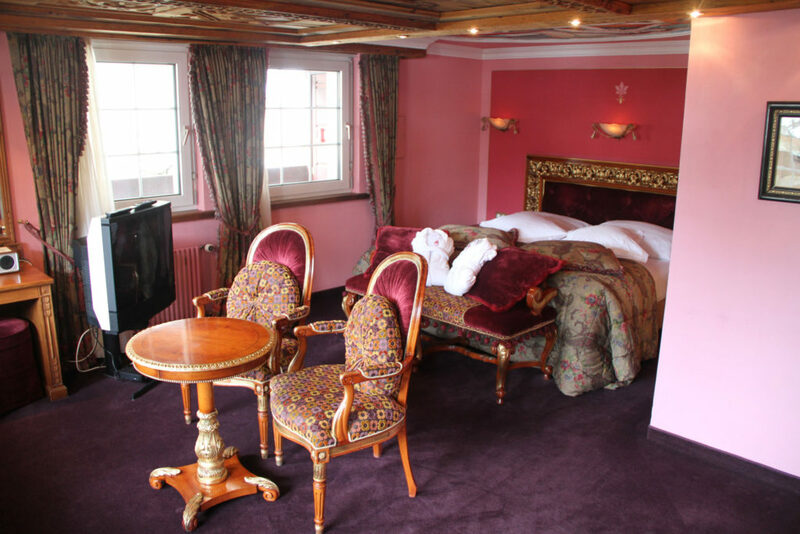 The Hotel Alex in Zermatt is a four-star ski hotel with ornate Swiss décor, conveniently located a block from the train station and the Gornergrat ski train. 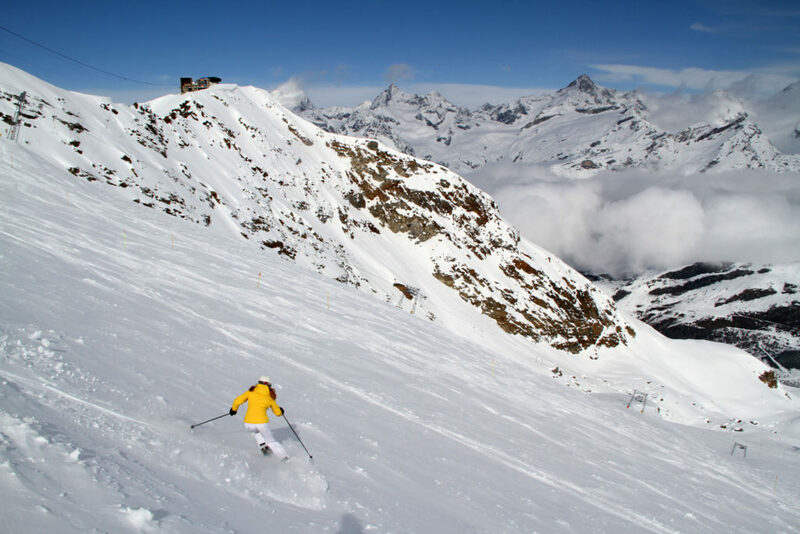 Hotel Monte Rosa, Mont Cervin Palace, and the Grand Hotel Zermatterhof are all traditional top Zermatt hotels, while the Suitenhotel Zurbriggen Zermatt is a minimalist style hotel and spa owned by famed Swiss ski racer Pirmin Zurbriggen, and The Cervo is a chic new alpine hotel, located at the base of the Sunnegga slopes. For après ski bars in Zermatt, we love the modern and slopeside Cervo deck and the Post Hotel for history and its in town location. 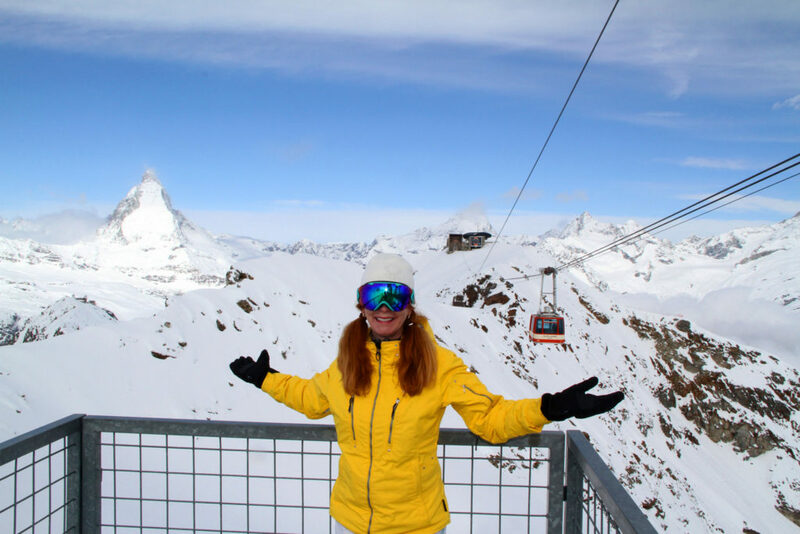 Zermatt Unplugged is a great time to plan your spring ski vacation, every day and evening top musicians perform on and near the ski slopes in a big week long Zermatt music festival. 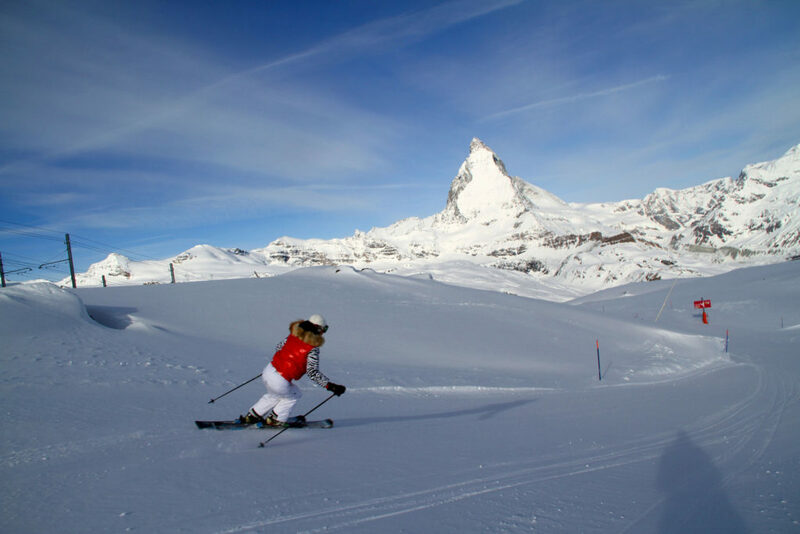 Zermatt has it all for the ultimate luxury ski vacation in the Alps, scenery, serious terrain, on mountain cuisine in traditional chalets, epic après ski, luxury hotels and no cars in this vibrant busy mountain village – reached by modern Swiss trains.